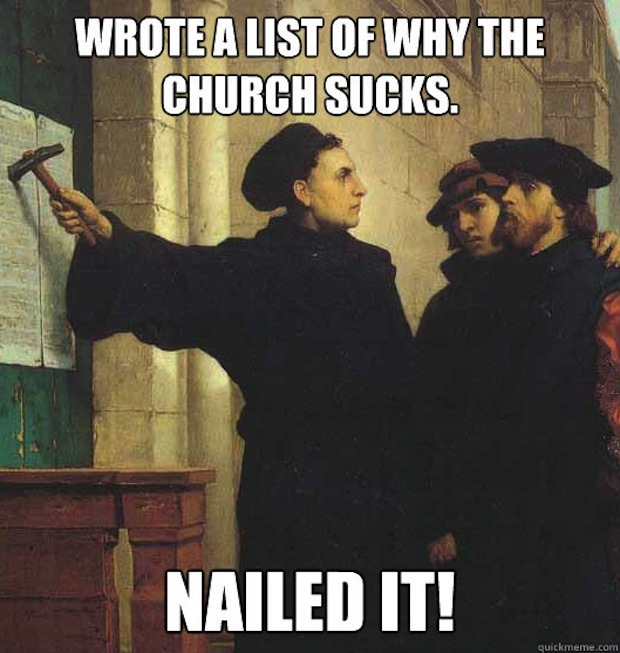 The biggest blow to the Catholic Church came on Halloween in 1517 when Martin Luther, a German monk, "allegedly" nailed his 95 Theses (or arguments) to the door of Castle Church in Wittenberg, Germany. 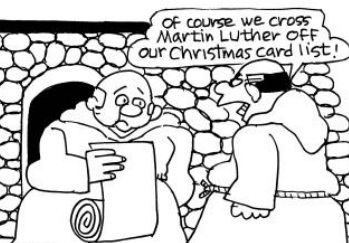 Luther was upset about the sale of indulgences, which allowed Catholics to pay money to be forgiven of sins. The money was being used to build the huge, new, Renaissance-style St. Peter's Basilica in Rome. 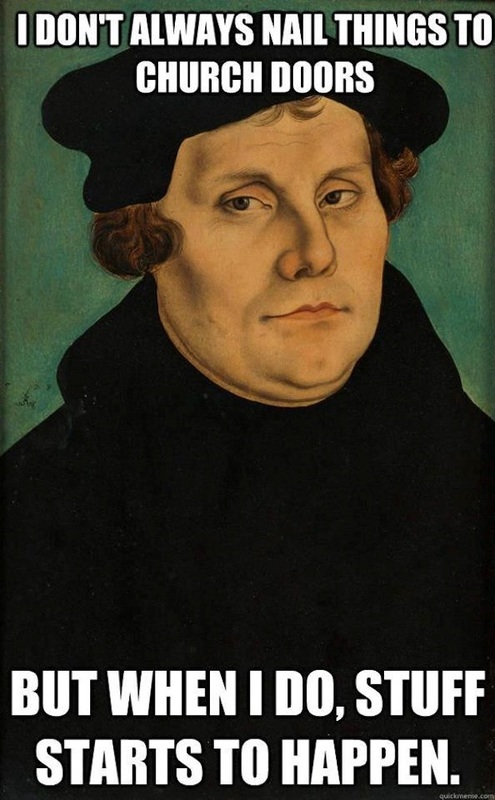 Luther also believed that every person could have a direct relationship with God, so there was little need for Catholic priests or Catholic rituals. 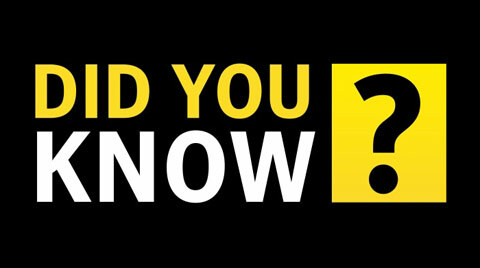 The printing press made such a direct relationship easier by supplying bibles in local languages, not just in Latin. People could now read The Bible for themselves. 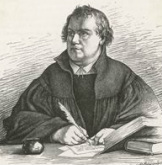 Luther's attempt to reform the Church is called the Reformation. His protest led to the establishment of Protestant churches, a new branch of Christianity. This allowed for the creation of Lutherans, Presbyterians, Methodists, Baptists, and many more. 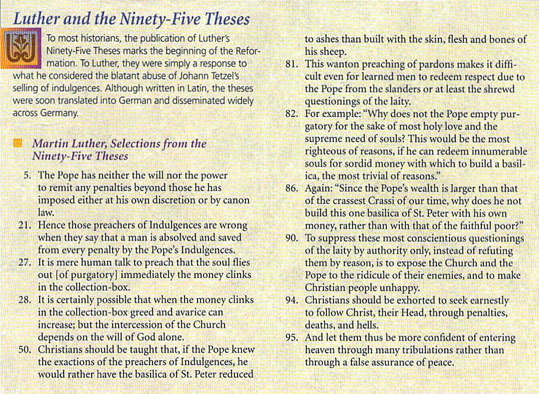 The Protestant Reformation not only fractured the Church, it opened minds to new ways of thinking. If it was possible to question the Church, it might also be possibble to question other beliefs about science, politics, and society. 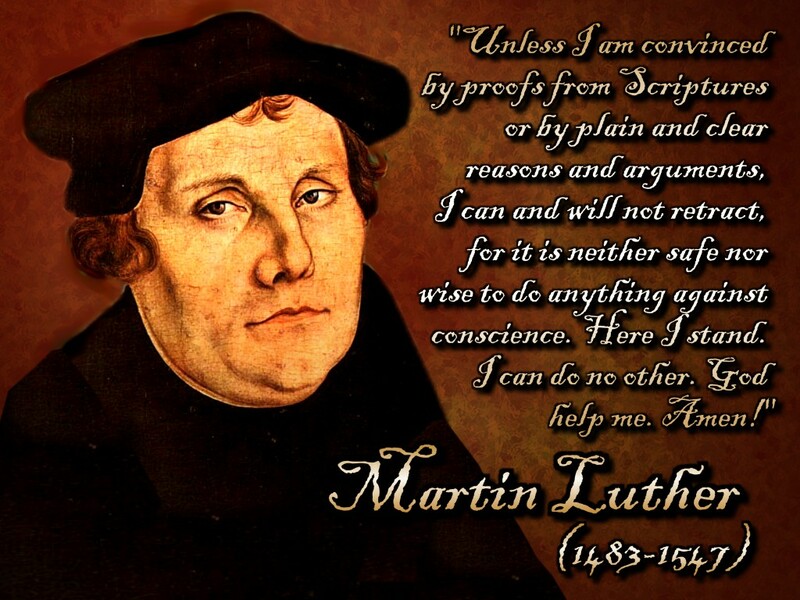 The Church excommunicated Luther in 1521, meaning he was kicked out and condemned to Hell. He met with the Holy Roman Emperor Charles V and was asked to recant. He refused and, supposedly, said, "Here I stand, I cannot do otherwise!" He was kept under house arrest at Wartburg Castle until his death in 1546. The name "Martin Luther" is also shared by the Civil Rights leader Martin Luther King, Jr.
the Catholic Church and began the Protestant Reformation. Inspired, the elder King changed his and his son's names from "Michael" to "Martin Luther". It's totally normal to have your name changed when you're... FIVE. 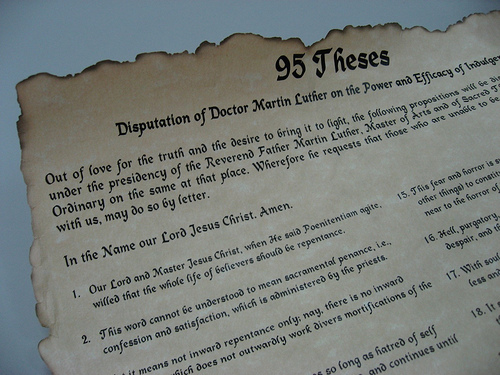 While it is thought that Luther nailed his 95 Theses to the church door, scholars have questioned this story, which does not appear in any of Luther's own writings. (And if you decide to tick off the church, that's probably something you write down...) Still, his complaints were made public, the printing press did save his life by spreading the ideas quickly. The Church couldn't just target Luther... all of Europe now knew. And, well, killing all of Europe seemed like more of a job for Germany. relationship with God. To reach the common people, he translated The Bible into English and delivered sermons in English, rather than Latin. Wycliffe died in 1384. The Church saw him as a heretic and ordered his body dug up... and burned in 1428... because that's a logical reaction.